Looks like that the fiction science story of that foldable smartphone that had been on social media a couple of years ago, will come true very soon. A few days ago Samsung released its brand new smartphones, that being aimed to compete with the three latest and biggest smartphone series from Apple. 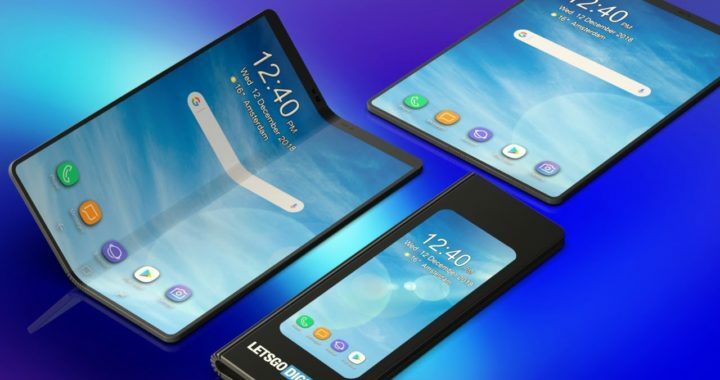 But at the same time, Samsung has presented the final shape of its fictional phone the Galaxy fold. The amazing engineering that Samsung has put into these smartphones regardless of it being a first generation product, Samsung fold has triple cameras on the rear, a high quality build all around and a gorgeous 7.3 inch dynamic AMOLED display. When unfolded, it also has 12 gigabytes of RAM buy from the 512GBs of storage, 4318 mAh of battery and of course the wireless power share feature that is going to allow you to charge compatible watches, Galaxy earbuds and other smart phones on the back of the fold. Despite the fact that it looks thicker than most of the available smartphones when it’s folded, this phone is still extremely easy to hold in one hand or throw in the pocket when you’re done of it. And like other Samsung phones, the Galaxy fold comes with a bunch of colors to choose from. You can get an Astro blue, Martian green and then cosmos black and space silver. It has the same 10MP selfie camera just like S10, and three rear cameras that has a telephoto lens. It also has a standard wide-angle lens, and a super wide angle lens that allows you to take sweeping shots when the phone is folded or when it is unfolded to see larger photo previews on the larger 7.3 inch screen. of course when you are doing a video conferencing on the larger screen when the phone is unfolded, you’re going to be able to see larger previews of the other person as opposed to a small preview on the top right or the top bottom that you usually get on other smartphones with smaller displays. And of course when it comes to media consumption, such as playing movies or playing video games or even looking at photos on your Samsung fold while it is unfolded, it’s going to be quite an amazing experience if you are looking for a larger screen in your life. One of the best things that Galaxy fold has, is it also brings Samsung decks to the table. So, you can connect an HDMI monitor to it exactly the same way you do with Galaxy note 9. Although, it’s a quite expensive smartphone, we can’t ignore that it’s the biggest step that ever made since 10 years ago or so. This is certainly a highlight of the technology world right now… it’s a 6 cameras phone and 2 screens. But unfortunately, it’s a $1,980 smartphone and not everyone can afford this price range. Tagged foldable smartphone apple, Foldable Smartphone Samsung, foldable smartphone zte, foldable touch screen phone.